• Using woodworker , upholster and advertising signboard . • Professional design steel body with advertising area is 2000mm (W)x 3000mm (L) . • Moving system X and Y axis : Rack and Pinion and Z axis : ball screw. • Max.moving speed is 18m /min. • VECTORSOFT High speed DSP 3 axes motion controller . • USB port with hot PNP support. • 32MB flash memory and it is can working at off-line status(Option: up to 128M). • Hand-controlle with multi-language LCD display easy to use. 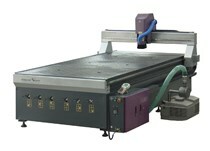 • 3000W spindle with frequency inverter privide Powerful motivity for cutting and engraving. • Standard file type: HPGL(3D) and G codes. • dust collection systems(Option) . • Vacuum hold down worktable (Option).